First Line: He was luscious. When one of veterinarian Kate Turner's canine patients digs up a bone she identifies as human, the entire town of Oak Falls, New York, is shocked to learn that DNA has identified town golden boy Flynn Keegan as the murder victim. The handsome boy never got a chance to go to Hollywood and become a star. Ten years leaves the police and the forensics team little to go on, and the grieving family begs Kate to conduct her own investigation. 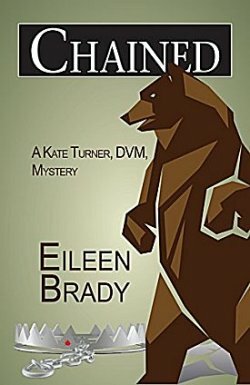 All she can do is go around town to interview the people who knew Flynn-- that and juggle all her patients, the defection of her current boyfriend, the re-appearance of an old flame, and worry about a brown bear that's roaming the woods outside of town. But all those questions Kate's asking? Well, she's definitely making someone very nervous. I absolutely love this series for the details of Kate's life as a vet. Eileen Brady has been a practicing vet for over twenty years, so no matter how silly some of those patients (and their owners) may seem, I have the feeling that they are all based upon fact. This verisimilitude makes me feel as though I could walk right into the book and ride along on Kate's housecalls. The mystery is a good one, and I also think I relived a few of my high school days as I read. With the defecting current boyfriend and an old one coming to town, I was worried that the mystery would take a backseat to romance, but my fear was groundless, I'm happy to say. Kate's grandfather the retired arson investigator is the voice of reason in her life, and Kate needs one because she had some low points in her investigation-- what I call Too Stupid to Live Moments. Like what? The snowpocalypse is going to close down the town completely, but that's the precise moment when Kate just has to go up into the mountains to take photos for evidence. Are you kidding me? Killer on the loose who's mad because you're learning too much. A bear roaming the area you're traveling to, and a blizzard that's already begun? Shame on you, Kate! It's a good thing that those veterinary house calls and the mystery are so good because, as a rule, I don't react well to Too Stupid to Live Moments. I'll be keeping an eye peeled on Kate during her next investigation to see if she toes the line. I always like learning a little about different professions, Cathy, so I can see how that aspect of this series would be appealing. And it does sound like a solid plot, too. I know what you mean about THOSE MOMENTS, but this does sound solid. It is (or I wouldn't've finished it).